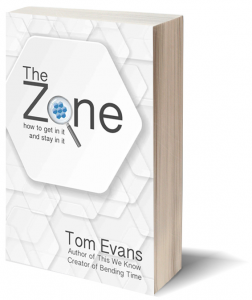 Do you want to know how to get in the zone and stay in it? Do you want to know what to do when you fall out of it? Listen to this short introduction to the book to find out more. Have you ever been in The Zone but not known how you got there? Have you ever been out of The Zone and wondered how to get back in it? Have you ever wondered where this somewhat mythical Zone actually was? Well this book is a map of how to find your way around it and how to stay in it. First we explore the Doing Zones where we are superbly creative and at the top of our game. Next we take a diversion to those places we end up where things don’t go so well – they are the Danger Zones. The third part of this book takes you to a special and magical place where life becomes a breeze – these are the Being Zones.